In September 2013, Sherman Alexie encouraged authors to be superheroes for their local independent bookstores and volunteer to hand sell books on Small Business Saturday, November 30, 2013, which is Thanksgiving weekend. This movement to support local independent bookstores has been named Indies First. According to NPR, over 1,000 authors signed up. I was one of them, unofficially, since my first book Summoning the Phoenix won’t be published until Spring 2014 (as the debut title for Lee & Low’s new Shen’s imprint!). To celebrate Indies First, I had a plan to visit five independent bookstores located in San Francisco and its Peninsula, even though I was only committed to selling at one. In the end, I only could visit four, and I had an absolute blast. 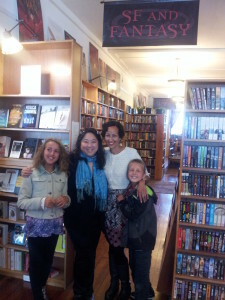 My first stop of the day was Borderlands Books in the trendy Mission District in San Francisco. Borderlands Books is a particular favorite of mine because its entire selection consists of Science Fiction, Fantasy, Horror, and Mysteries, and its wonderful, friendly staff have all been hand-picked to be extremely knowledgeable about these genres. 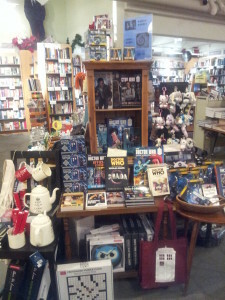 Borderlands is constantly hosting events for authors, and can accommodate up to 300 people its bookstore and cafe. The official Indies First guest author bookseller for Borderlands was Sofia Samatar, author of A Stranger in Olondria, published by Small Beer Press in 2013. A wonderful fantasy whose main character has a passion for words and for reading, A Stranger in Olondria is Sofia’s first book, and I had the privilege of listening to her read from this book at her first Worldcon reading. I’m a fan of her elegant prose style, and I highly recommend reading her book. Sofia currently lives in Southern California, where she works as a professor, so she and her family drove for eight hours to San Francisco just for Indies First. Sofia is also the poetry and nonfiction editor of the wonderful new online journal Interfictions, and she published my “A Pentatonic Moon” translations and song set in their very first issue. We all met up for a quick lunch at Borderlands Cafe before migrating to the attached bookstore next door, and we had a wonderful time chatting. With her permission, here’s a pic of Sofia and me with her awesome kids, who are also avid readers. It was a delight to talk to them about children’s books and manga, too. We had a great time selling books at Borderlands and several of the customers came to the bookstore actively seeking recommendations for Christmas presents for their loved ones. Perhaps the most memorable customer was the woman who came dressed entirely in San Francisco Giants gear. She was looking for the fifth book in the Game of Thrones series by George R.R. Martin and didn’t even know its title (A Dance of Dragons). She insisted that the book had to be the paperback version because the book was for her brother, who is homeless in Las Vegas, and he did not want to carry around the heavy hardcover. So if you see a homeless man hanging around the Vegas strip reading A Dance of Dragons, you’ll know that book came from Borderlands. My second planned indie bookstore of the day was Booksmith in the popular Haight Ashbury District of San Francisco, where Lemony Snicket and Lisa Brown were hand selling books. Their picture book The Latke Who Couldn’t Stop Screaming is a fun twist on the winter holidays. I had met them earlier this year at the SCBWI Golden Gate Conference, so I thought I would drop by and say hi and hear about their favorite books. Unfortunately I spent 20-25 minutes circling Booksmith and looking for parking before I gave up. I would have tried longer except I had informally promised Kepler’s that I would be a stealth author bookseller for them, and it was at least a 40-minute drive south of San Francisco, even without crazy holiday shopping traffic. So off I went! Before I went to Kepler’s, I dropped by The Reading Bug. It’s one of the newer independent bookstores in the area and it was my first time visiting. I love the ambiance of the place, whimsically decorated to be an enchanted forest populated with bookshelves. 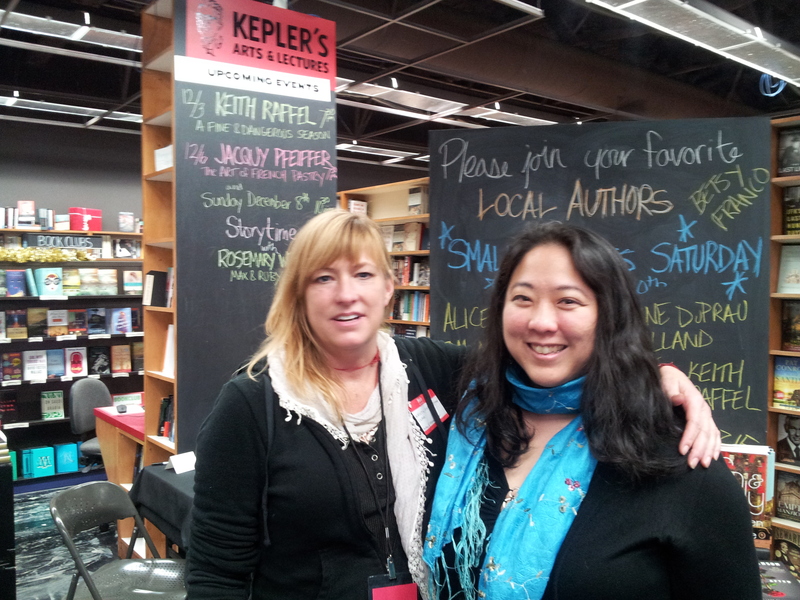 The staff were quietly friendly and supportive of local authors. What impressed me the most was that they had two or three bookcases completely devoted to bilingual children’s books, mostly Spanish-English and Chinese-English. Very cool. Unfortunately, I missed seeing their Indies First bookselling author Jenni Holmes, author of the popular Babymouse graphic novel series. After The Reading Bug, I made my way to Kepler’s Books, the oldest local bookstore on the San Francisco Peninsula, and a sentimental favorite. I was most recently there for the release of Betsy Franco’s Naked, her first novel for adult readers. 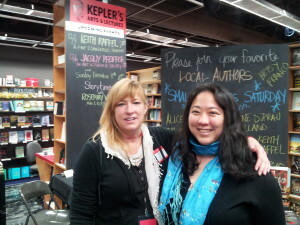 Out of the four independent bookstores I visited for Indies First, Kepler’s had the most local authors hand selling for them, ten total, and the official list included several authors who write for YA and children: Betsy Franco, Kristin Elizabeth Clark, Jeanne DuPrau, L. Tam Holland, C. Lee McKenzie. And I also volunteered as a stealth author bookseller. Other local authors who were also hand selling books during this time were: L. Tam Holland (The Counterfeit Family Tree of Vee Crawford-Wong), C. Lee McKenzie (Alligators Overhead), and Keith Raffel (A Fine and Dangerous Season). They were all so friendly and Keith even took a cart full of books to sell to people at the nearby Cafe Borrone. The most interesting customer I helped at Kepler’s was not the right buyer for any of these books. She was a 60-something-year-old woman who was looking for comic books for someone who was in the hospital and doesn’t really like to read. When I asked her the age of the non-reader, I heard “six,” so I instantly thought of Babymouse by Jenni & Matthew Holmes. Then the customer explained that the book was for her sister-in-law, who was sixty years old (not six) and had trouble reading books with too many words. So I recommended The Arrival by Shaun Tan, one of my all-time favorite wordless picture books. When she did not respond positively to that book, I showed her the beginning of Brian Selznick’s The Invention of Hugo Cabret, a wonderful hybrid novel whose narrative is divided into alternating sections of only pictures and only prose. It’s a different format from a graphic novel (aka comic books), where the words and picture are integrated on the same page. She liked it, but did not think it was right for her sister-in-law. In the end, the woman left with a graphic novel of Pippi Longstocking, which she found on her own. Even though none of my suggestions worked for her, she left the store happy with her book, and that’s what matters the most. Finally, even though I was quite tired, I dropped by Books Inc. in Palo Alto. Books Inc. is the largest independent chain of book stores on the West Coast, and every store I’ve visited always has a nice children’s section. I had arrived too late to meet their Indies First authors, but I had fun browsing. Right next to the entrance they had a gift wrapping section with a gorgeous selection of wrapping paper. 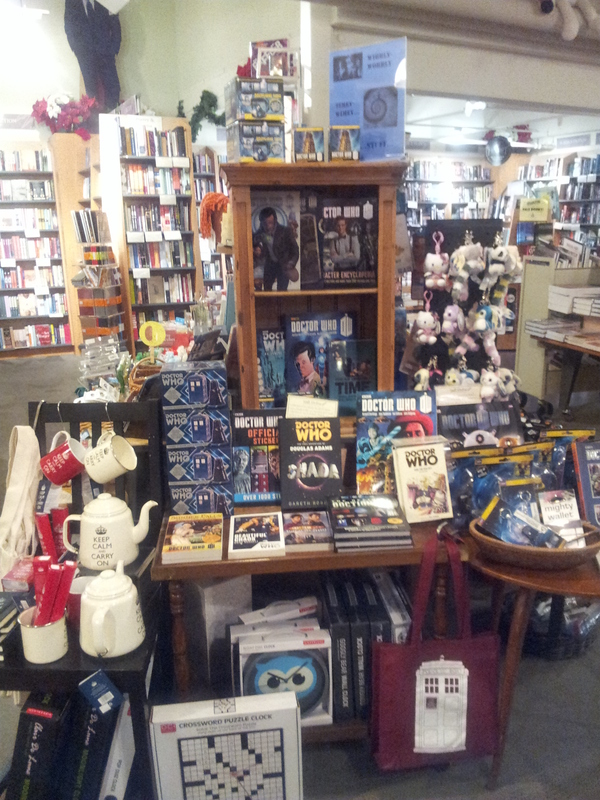 My favorite display can be found in the center of the bookstore: a tower of Doctor Who books and gifts to celebrate the show’s 50th year! Volunteering for Indies First was a lot of fun, though it wasn’t always easy. It’s fascinating to have a taste of what professional booksellers do everyday. 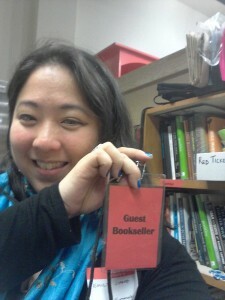 I had a wonderful time talking books and helping people find the right kinds of books for very specific readers. Even though I made it to four, almost five, independent bookstores in one day, I wish I could have visited more, especially those that are completely devoted to children’s books, like Linden Tree in Los Altos, Hicklebee’s in San Jose, and The Storyteller in Lafayette. They are all worth visiting. Because each indie store is different, with a unique ambiance that reflects the personalities of the people who work there, people who are passionate readers with a wealth of knowledge about books. While Sherman Alexie encouraged authors to be superheroes for Indies First, it’s truly the independent booksellers who are the unsung heroes of the literary world. Thanks to all the awesome booksellers for sharing your passion for books!